Warm summer nights make me want to lounge back with a cool beverage and watch the sunset from our back deck after the kids are in bed. I’m currently doing that in a camp chair—we’ve yet to acquire deck furniture since moving to the suburbs from the city. So I’m on the hunt for the perfect piece of furniture for outdoor relaxation. I keep being drawn to an old classic: the Adirondack Chair. There’s something about its sturdy simplicity and clean, unfettered lines that attracts me. It looks like something to settle into for the evening… or the weekend. The Adirondack chair was designed by a man named Thomas Lee. Suffering a shortage of patio furniture at his family summer home, Lee began to experiment on his front lawn with the chair design that is now so recognizable by its slanted back and seat, and its oversized armrests. After perfecting his design by testing it out on his family, Lee showed his “Westport plank chair” to a local carpenter, Harry Bunnell, who saw the potential profit to be made from tourists flocking to the mountains every summer. In 1905, without Lee’s knowledge, Bunnell secured a patent for the chair design that is now ubiquitous. For 20 years, he manufactured them as quickly as people snapped them up. The original Adirondack chair was constructed from 11 pieces of wood, all from a single plank. Characterized by a low-slung seat, slanted back, and wide arm rests, it’s ready to accommodate a cool, summer drink or a sleepy, summer book. Bunnell’s chairs were made of hemlock or basswood, and stained a dark green or medium brown hue. Over the years, artists, craftsmen, and carpenters have all put their own twists on the design. 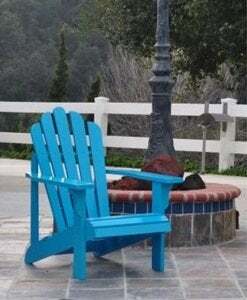 You can find Adirondack chairs in wood, recycled materials, and plastics—And in any color of the rainbow. They’re made in varying shapes and sizes: reclining, gliding, folding, with leg rests, for dining, bar stool height, cushioned, built for two, built for kids, and everything in between. They are as at home on the beach as they are on a mountain slope, in any season, in any setting. There’s a style of Adirondack chair for just about everyone. I’m afraid if I buy one, I might never want to get out of it. There are even a surprising variety of plans available for purchase, so with a weekend and the right tools, I could make one myself. Hmmm… I feel a project coming on. And the perfect place to kick back and relax once I’m finished.